Salonenque, or “Plant de Salon” is an exceptional, very old variety, which may stem from Thessalonica – whence its name. Typical of the Bouches du Rhône, its fruit is pear-shaped. Picked when green and tender in October, once prepared, they become the famous Broken Olives from the Vallée des Baux de Provence, distinguished by an P.D.O.. When they start turning mauve in November, they are introduced in the blend of our olive oil, conferring finesse and softness to it. 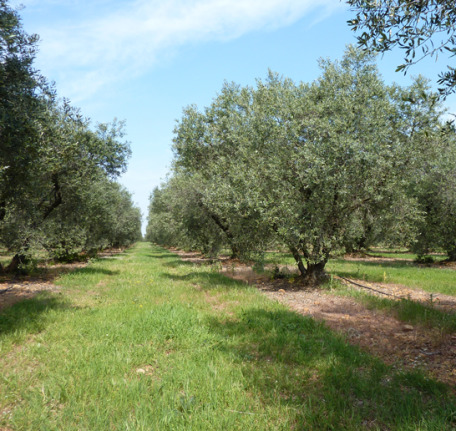 Béruguette, also known as Aglandau, is an olive variety that gives our oil its characteristic green colour, its aromas of greenery, its extraordinary green almond flavour, its character, fieriness, extended keeping qualities, and finally its authenticity. Prepared as a table olive, it becomes also the famous Broken Olive from the Vallée des Baux de Provence, distinguished by a P.D.O..
Verdale des Bouches du Rhône, with elongated fruit with white spots, has the particular feature of being resistant to the cold on our plots which are particularly exposed to the Mistral. It confers on our olive oil herbaceous and green apple aromas. It is also prepared as a green table olive. Grossane, which legend has it, was brought to the region during the Crusades by the Lords of Baux, is a pulpy olive, typical of the Vallée des Baux, which once prepared, becomes the delicious Black Olive of the Vallée des Baux de Provence, distinguished by a P.D.O.. Used for our olive oil, it confers mildness and the aromas of sweet almonds. Picholine, which stems from Gard, owes its name to the brothers Picholini who, in the beginning of the 18th century, made green olives edible by burying them in a mix of ashes of wood and chalk. The main French variety for the preparation of green table olives, it is picked from September to the end of October. Picked later, it confers fieriness and herbaceous notes to our olive oil. Cailletier, which stems from Alpes Maritimes, promotes the pollination of our groves. Picked when turning colour, it confers green or fresh almond aromas to our olive oil. Picked black, when fully ripe, it becomes a small table olive.